This photo is taken in Bolivia. Tiwanaku Spanish: Tiahuanaco or Tiahuanacu is a Pre-Columbian archaeological site in western Bolivia. The site was first recorded in written history by Spanish conquistador Pedro Cieza de León. He came upon the remains of Tiwanaku in 1549 while searching for the Inca capital in Qullasuyu. The name by which Tiwanaku was known to its inhabitants may have been lost as they had no written language. 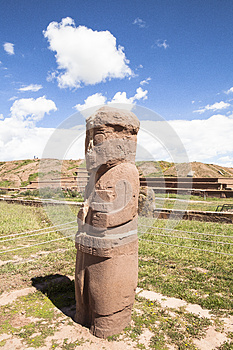 The ancient inhabitants of Tiwanaku are believed to have spoken the Puquina language.